Their 2017 Tour follows a very busy twelve months for Mrs. Brown’s Boys. After a sell out Tour of Australia and New Zealand and following the “Live” Episode of Mrs. Brown’s Boys as a special for BBC’s 60 Years of Comedy with an Audience of over 11m in July – SHE’S BACK with the hilarious “Good Mourning Mrs. Brown”. Recently voted as the Best British Sitcom of the 21st century by the Radio Times, Mrs. Brown’s Boys will make a triumphant return to arenas in 2017. The Award Winning Mrs. Brown’s Boys will be taking over some of country’s biggest venues for residencies including Saturday matinee shows with their production ‘Good Mourning Mrs. Brown’. ‘Good Mourning Mrs. Brown’ is part of the hilarious series written by and starring Brendan O’Carroll. This is the first time the production is heading out as a full arena tour. In this hilarious show in which Brendan has received some of the best reviews of his career, we see Agnes Brown planning Granddad’s funeral. The only problem is granddad is not dead. What could go wrong? 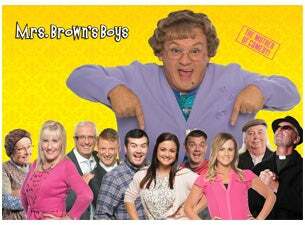 Mrs. Brown’s Boys success and achievements has been nothing short of incredible. From awards and accolades including three National Television Awards, TV Choice Awards, two Scottish BAFTAs, three IFTA awards with three nominations this year, a TV Times Award, Royal Television Society Winner and a TV BAFTA for Best Situation Comedy to being a ratings smash across the globe, Mrs. Brown’s Boys live has also broken box office records across the UK and Australia. Not only that Mrs. Brown’s Boys first full length motion picture Mrs Brown’s Boys D’Movie was the third highest grossing British film and highest grossing Irish film of 2014. The BBC ONE Christmas Specials over the past few years have been the most watched programmes over the festive period, watch this space for more specials due in December. If you haven’t experienced Mrs. Brown’s Boys live, Good Mourning Mrs. Brown it is not to be missed.